Their results were published on Feb. 14 in Scientific Reports. The article, "Unexpected rip currents induced by a meteotsunami," details findings that the storm formed a moderate-height (less than 10 centimeters) meteotsunami, which is what went on to cause the unexpected rip currents. Although these conditions may not be rare, this is the first time researchers have verified a meteotsunami-generated rip current (or meteo-rip, for short). "No one in the world has ever documented this before," said Chin Wu, professor of civil and environmental engineering at the University of Wisconsin-Madison. "Meteotsunamis are a new generation mechanism for rip currents." Wu explained that rip currents formed by the one-time wave of a meteotsunami can last for hours afterward. Beachgoers need to be cautious even after a storm passes. "Please do not go back to the beach because that's the most dangerous time. 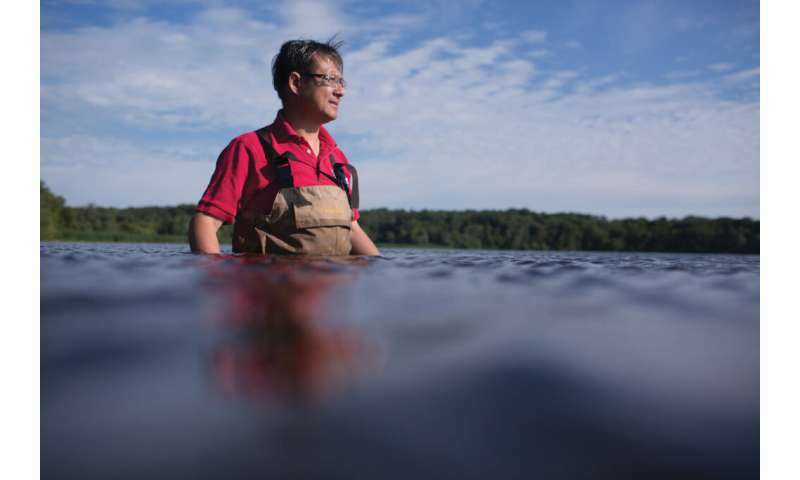 The water might look calm, but underneath, there's a hidden danger," Wu said. Eric Anderson, physical oceanographer with the National Oceanic and Atmospheric Administration's (NOAA) Great Lakes Environment Research Laboratory, is a member of the research team. The team was headed by Wu's Ph.D. student Alvaro Linares. "It wasn't explained before exactly what happened that day to connect all these different swimmers together into one event," Anderson said. "People maybe weren't even aware that a storm had passed a couple of hours earlier, and they decided to go to the beach because things had cleared up. They went in the water and this caught them off guard. When you see clear skies and calm conditions, you don't expect dangerous conditions on the shoreline. "In this paper, we see how a relatively small wave height of the meteotsunami translates into dangerous currents. It comes from the wavelength being so long. The wave may be short but when it's a kilometer long, that's a lot of water that comes to the shore and then retreats back over a few minutes. When that much water moves that fast, you get some dangerous currents," Anderson said. The water pushed by the wave escaped the shore by forming rip current channels. To document the meteo-rip formation, Linares, who recently graduated from UW-Madison and is now working for a consulting company in the United Kingdom, performed feats of forensic computing. Through powerful hydrodynamic modeling, he was able to reveal what was happening on the beaches at the time of the 2003 incidents, going from a grid scale of several kilometers down to one meter. He also used eyewitness reports of the events. The National Weather Service (NWS) currently issues beach hazard statements, which include conditions for rip currents but not for meteotsunamis. This journal article has forecasters considering how to include this new type of hazard. "As an operational forecaster for the National Weather Service, my thought is, how can I put this into action with a warning for people before the event?" said Robert Dukesherer, senior forecaster for the NWS in Grand Rapids, Michigan. "Meteotsunami-induced rip currents are something that will require an education effort and then we're going to need data in real-time to try to be able to forecast them while they're going on." Megan Dodson, a NWS meteorologist in northern Indiana, said this study, "Gives us the green light to say, 'Yeah, we're pretty confident that meteotsunamis impact current development and we should issue a warning.' "
The 2003 events sparked Dodson's passion for studying rip currents. Both she and Dukesherer are involved in the Great Lakes Water Safety Consortium, which works to make people aware of rip currents and other beach hazards. She finds the study's results validating. "We didn't even think rip currents could happen on the Great Lakes until the late 1990s," Dodson said. "It was the subject of debate all the way through the early 2000s. Even after we started doing the forecast warnings, not everybody was totally convinced that it was rip currents. A lot of people were saying it was just waves. So this study scientifically supports speculation of rip currents in the Great Lakes. Now we know there was something else going on!" Public education is also needed on the topic, Wu said. "I believe that everyone should talk to their parents, to their people, about this. After a storm is the time we should pay great attention for rip currents. The highest risk occurs when people pay no attention." Statistics from 2018 attest to the need for education about water safety. With 117 drownings, last summer was the deadliest on record for the Great Lakes, according to the Great Lakes Surf Rescue Project. Anderson thinks public understanding of meteotsunamis has progressed, but still faces challenges. "A lot of people picture those big tsunami waves from a Hollywood movie, and that's not what these things look like." Dukesherer said many people mistake meteotsunamis for seiches. "They're two very distinct things. A seiche is a sloshing in a bathtub that is rhythmic. There's a rise and fall on each end. A meteotsunami is if you put your hand in a bathtub and just rammed it from one side to the other," Dukesherer said. Video: What is a rip current?